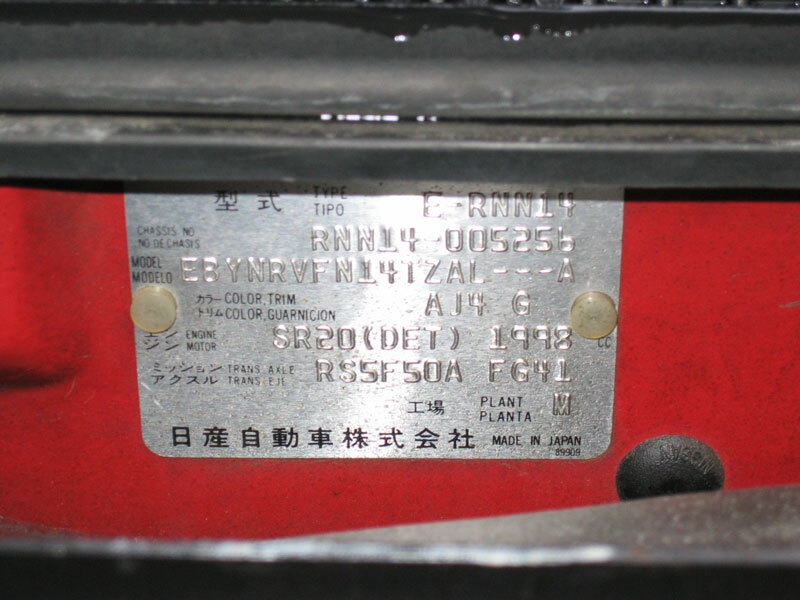 The model code is printed on the VIN plate, located top-centre of the firewall in the engine bay. The options descriptions above have been translated to English from the Japanese text in the Nissan FAST software. Emergency Locking Retractor (ELR) belts contain an interia reel which locks under sudden movement. This is the standard (only) type in the front seats. The 6567 cars that did NOT have this option would most likely have ALR rear seat belts (Automatic Locking Retractor) which lock into place once connected and tightened (used for securing child seats). 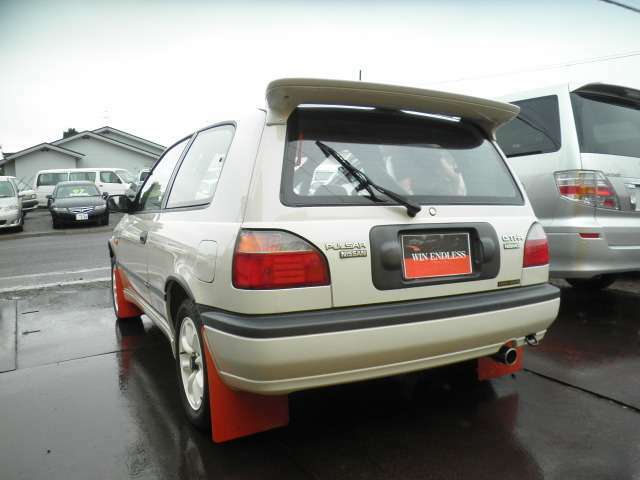 The GTI-R was designed and manufactured in Japan. Production ran from August 1990 until November 1994. The total number produced during those 4 years was 13842 (or 13832 - verification pending). Over 5000 of them were in the first 12 months (1990-91) so Nissan could fulfil the FIA Group A World Rally Championship homologation requirement at the time (5000 units in 12 months prior) in order for the car to be eligible to enter the WRC. See full production data here. The RNN14 was produced across two distinct "series" (S1 & S2, Early & Late, Zenki & Kouki). About half way through the production (August 1992), Nissan made a range of mostly aesthetic changes (around 10 items). Rather than being an evolution, it was more of a simplification or de-specialisation in the lead up to the planned completion of the N14 platform. They are defined by chassis numbers RNN14-100000 and above. Model code EBYNRV***. The GTI-RA model (aka RA, Alpha, Road, Luxury) was the standard model. Differences in the series listed here. Model code EBYNRR***. The GTI-RB (aka RB, Base, Beta, Rally, Homologation) was a simplified model marketed for motorsport use (rallying in particular). They had "luxury" trimmings (such as ABS, air conditioning and power windows) removed as standard, throw-away steel wheels and the interior trim from the base model Pulsar which reduced the kerb weight to 1190kg (2624 lb). Some of the RA items were available as an option. The engine was the same as the RA model, but most were optioned with a close ratio gearbox and Nismo front diff (see below for details). Weight: 30kg lighter (mainly due to removal of electrical systems). Closer-ratio gearbox (option - 77% chose it). Side mirrors: Black plastic (not colour-coded, standard - no power adjustment, could be optioned). Umbrella holder: None (a vent in place, standard). Rear diff housing: Larger cooling fins (standard). Rear wiper: None (option - 40% chose it). 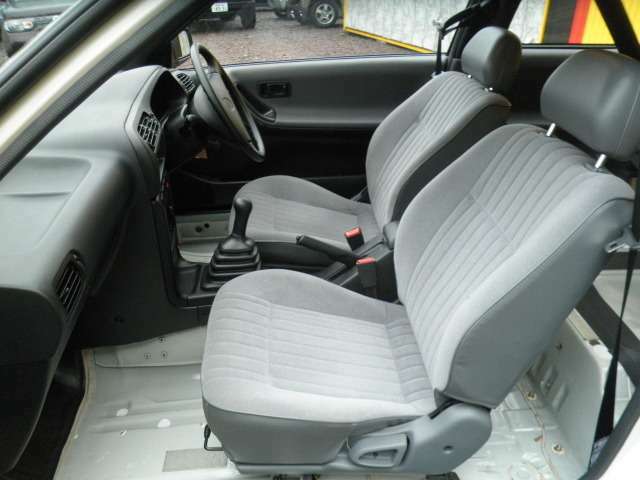 Interior: Base-model Pulsar (vinyl trim, basic seats, rubber gearstick boot, plastic gear knob, plastic steering wheel, standard). Exterior paint colour: Standard colour was Ivory White KJ7 (59% chose to keep it) but all colours could be optioned. Front LSD: Nismo mechanical (option - 80% chose it). ABS: None (not an option). 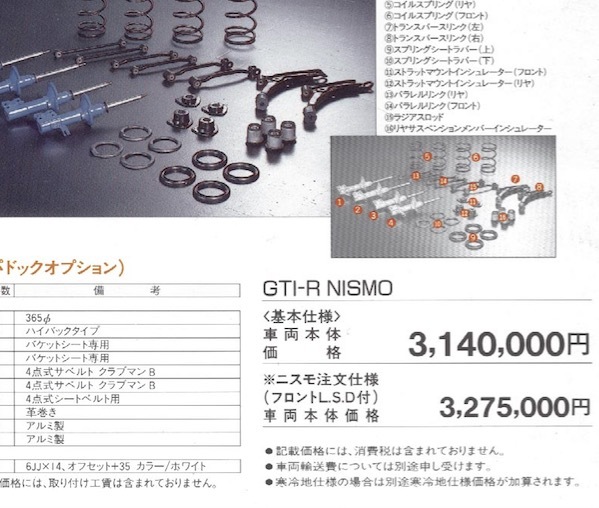 There were also many (over 100) Nismo "Rally Option" parts available, some were more commonly chosen than others. Colour code DL2. There were 100 examples with colour code DL2 (Mist Grey Metallic / Turquoise Metallic / Winter Green) produced, all during Series 2. DL2 was a standard colour for the rest of N14 Pulsar model range, but not for the GTI-R. With exactly 100 produced they are by far the rarest of the factory colours (next rarest is KJ7 with almost 800 examples) and strongly suggests they were some sort of special/limited production run. There were 98 RA and 2 RB versions produced - 59 RA + 1 RB in Series 2 Phase A (1993), and 39 RA + 1 RB in Series 2 Phase B (1994). The GNN14 model was a variation of the GTI-R built for the European market and badged as a "Sunny" (the name used for the existing N14 range in that market). There were both RHD (UK) and LHD (rest of Europe) versions, but there was no RB model. They are basically the same car, but have some parts from the RNN14 RA (Series 1), some from the RNN14 RB, and a few unique. See details here. Autech is a Nissan modification division (separate from Nismo, the core part of their focus is related to "mobility", although they also take part in performance upgrades). Autech were responsible for the installation of certain factory optional parts for new car packages (ones that were not appropriate for "dealer" installation). All recorded examples have been RB models. The parts installed were not a set list (they were based on individual orders) and could include items from both the Nissan and Nismo option catalogs (ie. roll cage, suspension, diffs, harnesses, seats, etc). 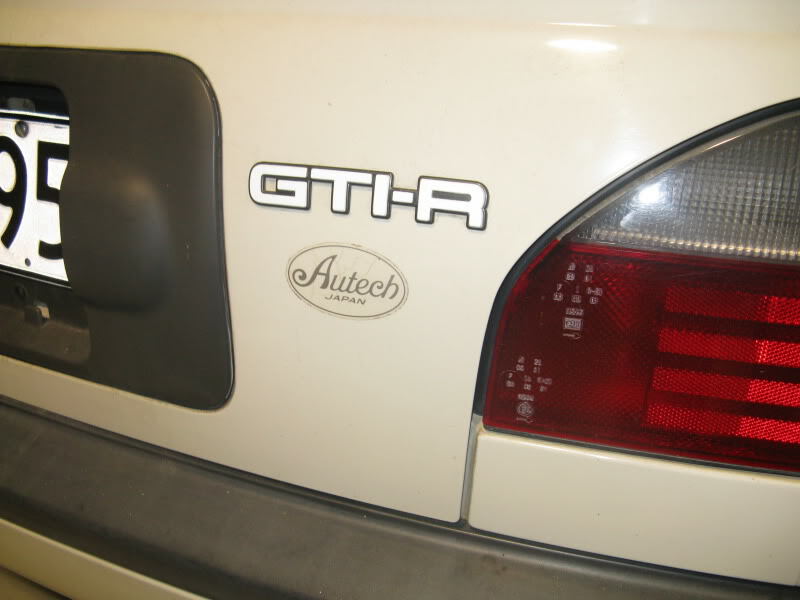 There was no special numbering, plaques or badges - just a small oval-shaped "Autech Japan" sticker on the boot below the GTI-R badge (which can be purchased new from Nissan). Some, but not all, are clearly flagged in the Nissan FAST software as "Autech vehicle". They did not produce a "Complete Car" version/edition like they have for some other Nissan models (Skyline, Stagea, etc). Basically, a GTI-R that was sent to Autech is just an RB. Nismo offered a "Complete Car" model based on the RB. 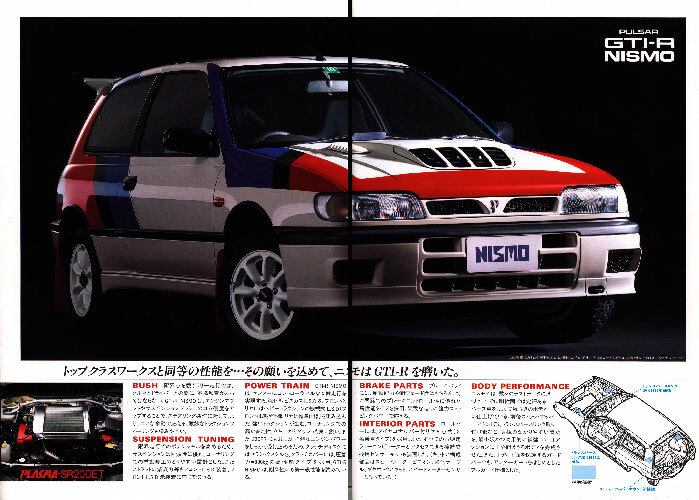 Marketed as the "GTI-R Nismo" it featured many of the Nismo rally options (suspension, diffs, seats, roll cage, foot rests, underbody guards, strut tower strengthening, no carpet or rear seats, etc - see below). Unlike most of their other "Complete Car" offerings, no engine changes were made, and they are not listed on the Nismo website "Complete Car" archive. The price in base configuration was 3,140,00 yen. Nismo (Japan) confirmed via email in 2010 that only 21 of them were produced. They had an individually numbered Nismo plate on the firewall (in addition to the standard VIN plate), and a Nismo badge below the GTI-R badge on the boot. The "livery" was optional. We have records of 4 of them so far (#005, #010, #020 & #021). If you are an owner of one of the others please let us know!